In British Columbia, numerous Morgellons sufferers believe that mysterious fibers and microscopic slivers removed from their bodies are nanotech devices, sprayed onto the unwitting populace by jets. David Icke sees trails of gum-like residue littering the Isle of Wight and concludes that jets are spewing a toxic substance specially designed to kill us. The feature-length 2011 documentary What in the World Are They Spraying? hints that a massive-but-covert geoengineering experiment is underway, possibly without the knowledge or consent of our elected leaders. In one portion of the film, actress Mariel Hemingway laments that someone is trying to wipe out organic agriculture by blocking the sun’s rays. At the website Universe Creator, someone insists that jets are spraying an airborne Ebola virus. Bizarrely, he/she identifies Ebola as a genetically engineered herpes virus. In Alberta, a member of We Are Change Calgary frets that ELF waves from the HAARP array in Alaska, combined with metal oxides sprayed from jets, are going to alter her body chemistry and control her mind. Another member rushes her child to hospital each time there is “heavy spraying” in her area. Tom Bearden, a retired Army lieutenant colonel, tells lecture audiences that scalar weaponry, derived from scalar field theory, has been in use for over three decades. Some proponents of his theories say the materials in jet contrails facilitate vast scalar defense systems that are invisible to the public. On Facebook and other social networks, people post photos of unusual jet contrails and cloud formations, complaining that their friends and family members can’t see what they see in the skies. August, 2007: At a 9/11 Truth conference in Vancouver, Alfred Webre tells attendees there was heavy jet activity over the city in the week preceding 9/11. “Our conjecture,” he says, is that the spraying was intended to dampen the “civic enthusiasm” of residents. Today, Webre is trying to ring the alarm on teenage Obama’s secret teleportation to Mars. These are simply a few examples of the fear, confusion, and weirdness that surround the subject of “chemtrails”, also known as jet condensation trails (contrails) or vapour trails. 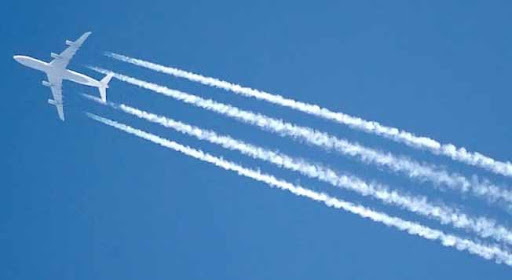 Though contrails have been in our skies for as long as high-altitude jet travel has existed, many observers insist they look different now; they last longer, dissipate more slowly, and are more numerous than ever. They point to crosshatched contrails and filmy cloud cover as evidence that jets are spraying some unknown substance into the air, for reasons unknown. Not that there aren’t theories, as you can see from the examples above. Ideas about what chemtrails might be range from the mundane (military chaff, cloud brightening agents) to the super-fantastical (Tesla-inspired technology capable of repelling UFOs, vectors for nanobots, depopulation method). The chemtrail theories have spawned many local TV news stories, an episode of the Discovery Channel program Best Evidence, a Beck song, chemtrail conferences in at least two countries, the aforementioned documentary, and hundreds of websites. A Google search for “chemtrails” typically returns over 2,000,000 results, while a search for “contrails” gives you just 1,880,000. Chemtrail whistleblowers, people who claim to have been part of secret spraying operations. We’ll also hear what a professional pilot with 46 years’ flight experience has to say about chemtrails. Most importantly, we will attempt to answer questions about the potential hazards of contrails. Do they pose a threat to human health and the environment? Are we, as the folksinger below contends, being murdered from the sky? Lots of chemtrail-watchers mistake ordinary jet components for chemtrail-spraying equipment. Don’t be one of those people. Is chaff responsible for chemtrails? What about all that aluminum? A close look at other military and civilian operations that involve aerial spraying. Could any of these things account for chemtrails? Some of you might feel I’m dumbing this down too much at times, but please keep in mind that we’re living on the same planet as reality TV stars and the rainbow sprinkler conspiracy lady; I can’t even take it for granted that people understand why rainbows form. This entry was posted in Chemtrails, Conspiracy Theories, Controversies and tagged chemtrails, conspiracy theory, Following the Chemtrails, health. Bookmark the permalink. When YOU remove MME’s (MicroMechanical Electronic devices) from beneath YOUR skin (verified by a laboratory), and when YOU pick a fiberous looking sore on your face and pull out a four inch long, ultra-thin fiber that move as though it has intelligence, then you can lecture me on the “superfantastical”…. I recently found your site and love that it seems to portray a lot of information to dispelling conspiracies but have to wonder who you are, what your credentials are, and perhaps in some cases, where you are getting your information from – I hate when one of my conspiracy theory nutty friends challenge info I give them because they say the source is not any more reputable then from where they are getting their information. So who are you (experience and/or degree) and how do you get your information? Did you really expect a reply? This site is nothing but MISINFORMATION!!! The kind of misinformation that is dangerous to one’s health! You should listen to your friend. What’s happening is no “theory” – it’s a fact.